The groundbreaking work to address the impacts plastic is having on our marine environment has been recognised with two awards. At the prestigious international Beyond Sport Awards, in New York, the programme won in ‘The Best Corporate Campaign or Initiative in Sport for Good’ category. The judges commended the programme for its ‘fantastic use of a global platform to spread an important message around the danger of plastic pollution’. They also commented that the campaign encouraged young people to become climate activists and used robust scientific research. Working to promote the UN Clean Seas campaign and through a range of communication channels the message reached millions of people during stopovers and many more through media and online platforms leaving a lasting legacy. 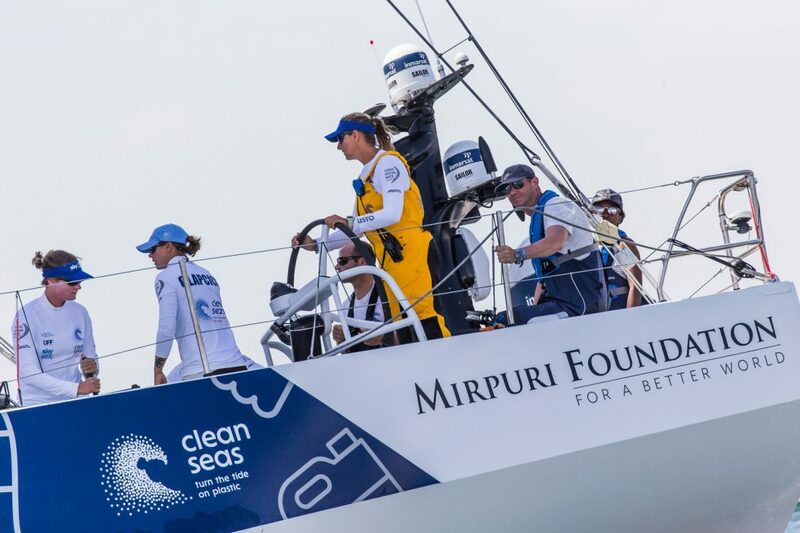 The programme saw the race work in partnership with Principal Partner the Mirpuri Foundation, Founding Principal Sustainability Partner 11th Hour Racing and the UN Environment’s #CleanSeas campaign. Anne-Cecile Turner, Sustainability Programme Leader, said: “We set out with the ambition to engender positive behaviour change to tackle the plastic crisis affecting our oceans. As a global sporting event we have minimised our own footprint and educated and empowered the millions of people the race touched. 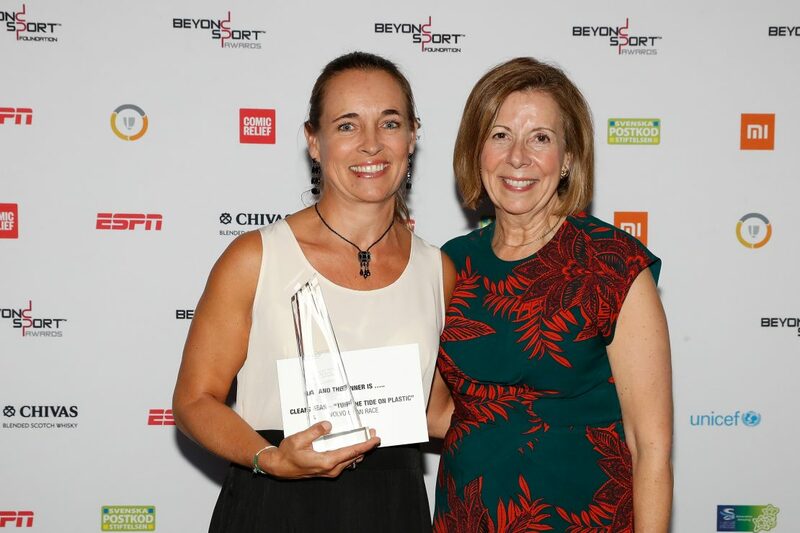 Alice Greenwald, President & CEO, National September 11 Memorial & Museum presenting the award to Anne-Cecile (Sustainability Programme Leader), at the Beyond Sport Global Awards on September 12, 2018 in New York City. “By working with a range of supportive and inspirational partners we were able to realise our ambitions and leave a lasting legacy for ocean health and are thrilled this has been recognised by Beyond Sport and the EPA. Working with our other main partners, Volvo, AkzoNobel, Bluewater, Stena Recycling and Ocean Family Foundation, the programme aligned to the UN Sustainable Development Goals. “The Volvo Ocean Race enabled us to showcase in real-life at each Volvo Ocean Race stopover how Bluewater is already today turning words into action to deliver sustainable drinking water to people and businesses in heartily populated urban environments regardless of the quality of the water source,” said Anders Jacobson, President and chief strategy officer at Bluewater. 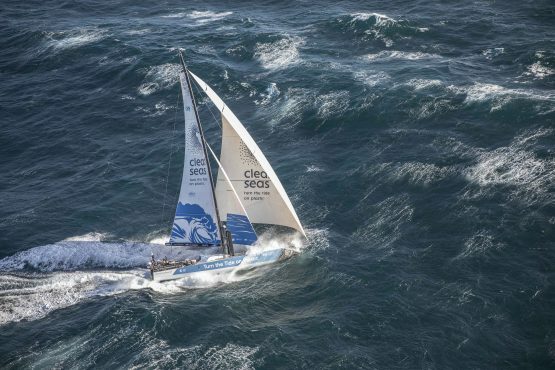 To advance science by combining it with sailing, an expert scientific consortium, funded by Volvo Cars, used cutting edge technology to build state of the art equipment that would capture the most relevant ocean data. 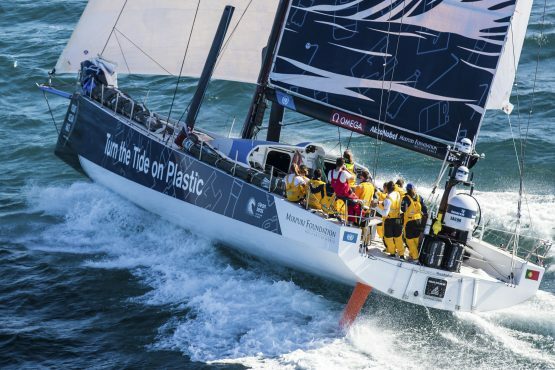 Stuart Templar, Vice President, Internal Communications & Sustainability, Volvo Cars, said: “Volvo Cars is delighted that the Volvo Ocean Race Science Programme has been recognised by the Beyond Sports Awards. We’re proud to have supported the Programme and help promote understanding, awareness and action on the global problem of marine plastic pollution. 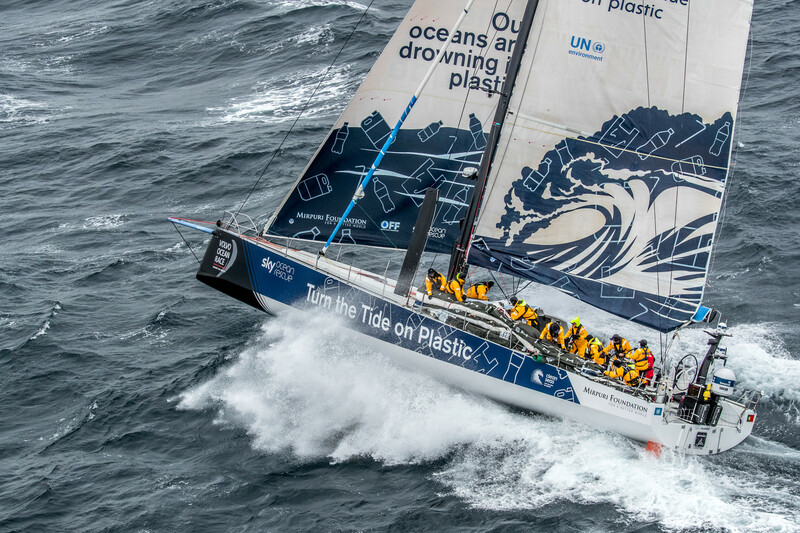 The Turn the Tide on Plastic boat, supported by Sky Ocean Rescue, alongside Team AkzoNobel’s boat, collected seawater samples that were tested by race scientists for microplastics as well as levels of salinity, dissolved CO2 and algae. The findings were uploaded ‘open source’ to benefit scientific understanding of the plastic threat. Convening a series of Ocean Summits and workshops, at key host cities, the problems linked to our seas were discussed by key influencers, such as politicians, scientists and business leaders, and innovative solutions proposed to shift current thinking and drive action. Lisa Emelia Svensson, Director for Ocean, at the UN Environment, added: “This award shows what we can achieve together. Sport is a fantastic way to engage people all over the work across sectors, culture and gender. The annual Merit Award, presented in Boston, recognises outstanding environmental advocates who have made significant contributions toward preserving and protecting our natural resources.